Categorized as: Africa, Girls & women, Job Creation, Leadership, Poverty Alleviation, Stories, Storytelling & Tagged as: Community knowledge worker (CKW), Empowerment, Farming, Grameen Foundation, Mobile technology, Uganda on March 21, 2015. 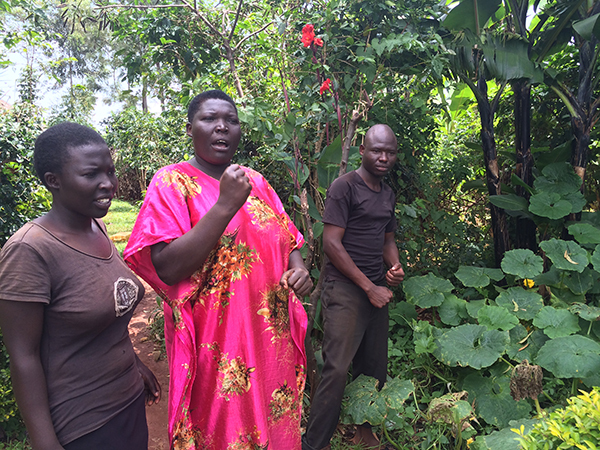 Editor’s note: Grameen Foundation’s Community Knowledge Worker (CKW) initiative brings useful knowledge to rural farming communities throughout Uganda. In this online chat, Esther, a local leader and dedicated volunteer CKW to 100 neighboring farmers, talks about her experience with the program. To jump right to the webinar with Esther explaining the mobile-phone app that teaches her best-practices, weather forecasts, and fair-market crop pricing, click here. 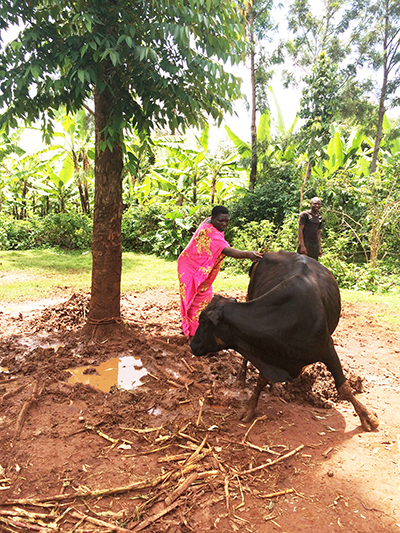 Grameen Foundation’s Community Knowledge Worker (CKW) initiative, launched in Uganda in 2009, serves farmers in remote communities through a network of peer advisors. The initiative combines mobile technology and human networks to help smallholder farmers get accurate, timely information to improve their businesses and livelihoods. As farmers themselves, CKWs use smartphone applications to give their fellow farmers information on weather and market prices, as well as advice on crop care, animal husbandry, and disease prevention. From its start in Uganda, the Community Knowledge Worker initiative has been expanded to Colombia and Ghana, and a similar initiative is planned for the Philippines as well. As part of its celebration of International Women’s Day, Grameen Foundation hosted a live chat with Esther, a CKW in Uganda. Esther is an incredible woman who volunteers in her community, helping women in need and teaching life skills to neighborhood girls; as a CKW, she helps her neighbors earn more money from their farms. Her neighbors come to her with questions like how to save sick livestock, how to increase crop yields, and where to get the best prices for their harvest; she answers with the help of her smartphone. During the live chat, she answered questions about her work in the community, life in the village, and the challenges women face in rural Uganda. Below, we share some highlights from Esther’s live chat! To watch the chat in its entirety, click here. GRAMEEN: Tell us about your farm and what else you do for a living. ESTHER: My farm is doing better because now it produces about 375 kilograms of coffee that helped me pay for the cost of my son’s education, which has now been successfully completed. My family’s doing very well because of my banana plantation. I earn most of my living by selling coffee and milk production. I also sell wholesale crops and vegetables. With my savings, I am able to buy machines for my farm. I also facilitate women’s savings groups. Esther with her stubborn but beloved cow. GRAMEEN: How does your CKW work empower women in your community and what are some of the challenges that come with it? ESTHER: In our culture, women are not supposed to own property. They were never allowed to sell products in the market. Through working as a CKW, I was able to mobilize women by giving them information about how to sell products in the market. I helped in training them and now they have also learned how to plant their own crops. For instance, the selling of coffee was always associated with men in our society, but now that has changed. It was hard to convince people in the beginning but through counseling the community, I was able to explain that women invest in families more than men do. If they are in the market selling coffee, the money will be used for the household more effectively and will bring positive outcomes for everyone. Another challenge I face is that people are slow learners, so they do not adapt to the information right away. GRAMEEN: Can you tell a difference in your neighborhood since you started to work as a CKW? Tell us about one specific farmer you helped. ESTHER: My neighbors are earning more money and have better farms now. My banana plantation has improved due to preserving water by digging trenches in the rainy season, which helps the banana production later. I helped a woman who did not know why her poultry was getting sick. I gave her information from my phone about how to use salt water and aloe vera to solve the problem. She told her neighbors about it and the information was made available to more people. Men also came up to me asking about how to plant coffee and we did a demonstration for them. 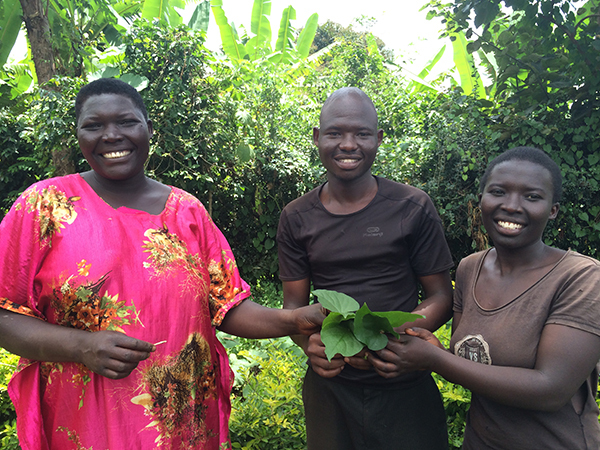 Esther (center) with her young-adult children, Sarah (left) and Moses (right). GRAMEEN: How do other women feel about you being a leader and how has being a CKW improved your status? ESTHER: Women like how I am fighting for their rights. They know how to save money for household goods and children through all the saving groups we have formed. They no longer have to trust just their husbands and ask them questions specifically. My voice is respected and people want me to counsel them whenever they have problems. JOIN “Team Grameen”: If you’re inspired by Esther’s story and Grameen Foundation’s work, this is great time to join “Team Grameen.” Through the end of March, an anonymous donor has agreed to match all donations to Grameen Foundation, dollar-for-dollar, up to $10,000! That means each gift will go twice as far to empower women like Esther and their communities with resources that can improve their livelihoods. There’s no better time to join in this important work! All photos provided by Grameen Foundation.